The Italian white truffle can be harvested from August until the end of December but in August and early September the fruiting bodies are usually severelyinfested by insect larvae such as Suillia univittata. Unlikethe Périgord black truffle the Italian white truffle is used either uncooked or added to dishes after cooking, for example, as a flavoring for pasta or salads, to retain thedelicate, volatile aroma. As the Périgord black truffle isusually used in cooked dishes and is harvested between December and February there is little competition in the marketplace between the two species. 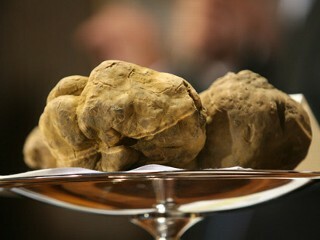 Typical wholesale prices can be up to Lire 5,000,000per kg (US$2000) but in November 2000 at the Alba truffle festival prices topped US$13,000/kg. 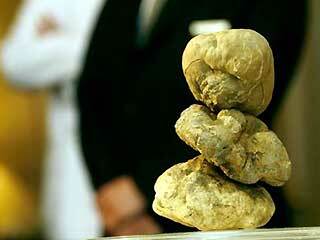 Generally large truffles in excess of about 250 g and up to 2 kg command relatively higher prices. The harvesters receive about 60%of the wholesale price. In Italy, to avoid tax imposed on truffle sales (paid by the seller), as much as half of the crop is sold on the black market. Sold for up to US$9000/kg, Tuber magnatum (Italian white truffle) is themost expensive of the truffles.Tuber magnatum (Italian white truffle) has not yet been cultivated and so supplies are restricted to what can be harvested from natural truffières likethis one in northern Italy (with thanks to Dr A. Zambonelli).